As part of my series about prominent entrepreneurs and executives that overcame adversity to achieve great success”, I had the pleasure of interviewing Kathleen Black of Kathleen Black Coaching and Consulting. Beginning her career as a ReMax Real Estate Agent and working her way to being recognized within the top 1% of Realtors on North America’s largest Real Estate board (the Toronto Real Estate Board), many would agree that this level of success is the pinnacle achievement amongst their peers; but for Kathleen it was only the beginning. Identifying the need, Kathleen set out to work on further developing the systems and platform of educational programs and coaching methods to which she attributed her own professional and personal success. 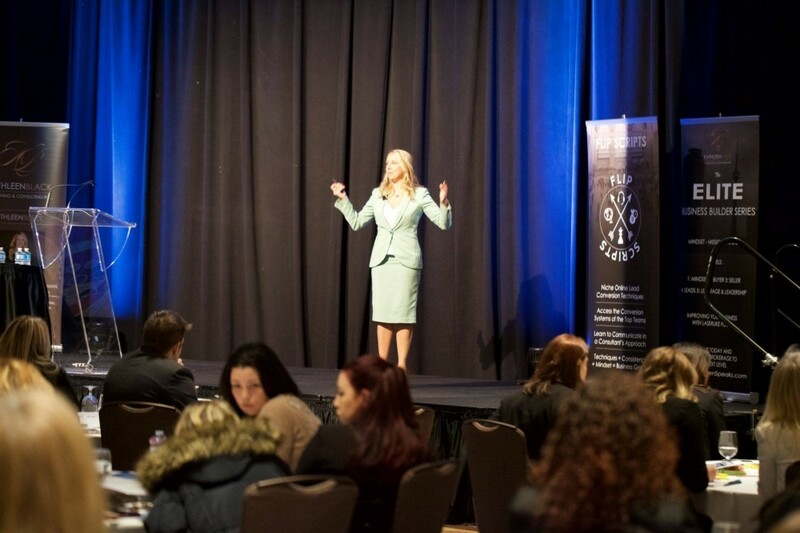 With the launch of KBCC in 2015, and building upon her 10+ years of Team and Agent development and guidance, hundreds of teams (80% of which are top 1% producers) have attributed their growth and success to Kathleen’s integrity, honesty and results driven leadership directly or through one of her coaching programs. Kathleen Black: I was selling real estate as a busy single mom of two children and I had done a lot of content and systems development with a look to creating better work life balance. The team I worked with was creating a coaching company and I had a background in psychology so it just seemed like a natural fit to try to become involved. That coaching company found itself in some challenging territory in early days and there were differing opinions within the ownership as to how it should be resolved. This ultimately resulted in the departure of the director of coaching and I was given the opportunity to step into that role within 18 months of the company going live. I had been a coach for just under one year at that point. It was really a chain of complicated events that led to a great opportunity for me. Black: I moved on from Director of Coaching to Director of Operations in a relatively short time and became half owner of the company with access and full decision-making authority. At that time the books were opened to me and it was instantly evident that the company was in quite a bit of financial difficulty. I played a significant role in turning the company around. I led the clearing of about $180k in debt and revamped the majority of the content which led to considerably stronger client retention. As things were turning around, my (largely silent) partner decided they wanted to go in a different direction professionally. I was presented with some difficult questions; ‘Is this who I am, can I look at my children in the face with integrity if I don’t stand up and defend what I have built, what will I do if I don’t do this’. I remember fear. I remember the reality of having bills to pay. I also remembered some great advice I had been given; ‘If you really believe in it, bet your house on it’. Ultimately, I went all in. I stood up for myself. The result of that pivotal moment saw my shares bought out, half of the client base following me to the new company based on the content I owned, and within a month and a half my client roster was full. Within three months, head down and determined, I had a client roster that occupied a second coach as well. Necessity and focus were the defining factors in my early success. Black: One of my core principles is the idea that the battle is won before it’s fought. I have always felt that if I do the right thing, and I have the right intentions that the desired result will always follow regardless of the time it takes. If you can see it in the future, if you do the right thing, if you have positive energy around you, it will always lead to good things. I’ve been convinced for a long time that I’m meant to do what I am doing, that if I make the hard decisions now the payoff will be greater in the long run. Black: Total commitment. I committed ALL of my energy and ALL of my resources into building the business. I took the financial risk, and I put together a two-year plan that saw evening and weekend sacrifices with my head down to build the company. From a next chapter perspective, and having a pragmatic hope that we might see 50% of the business level that was there at the separation, I realized first year performance 50% GREATER than what the original company had done in its first year, and 75% in the second year. Avoiding hesitation and committing fully to what I do well is, I believe, entirely responsible for the position we are in today. Stand on your own. Be comfortable with the idea of standing in a dark room, with nobody around you, by yourself. The people you thought were standing with you may not truly be there. My willingness to leverage myself and risk everything is the purest example of this. Believe. From a spiritual standpoint, I believe I am meant to perform service to people in sales-based functions. I cannot afford, either spiritually or financially, to be distracted from my greater purpose. The trials and tribulations in the business along the way, I believe, serve only to remind me that I’m strong enough, and that my intentions are pure enough to overcome them, and that they existed to educate me and enrich our offering to our clients. Plant the seeds without expectation. In the tarot world, they call it the fool’s card. Many would suggest that if anybody knew what was going to be involved in overcoming all of the obstacles that stood in the way of our current place, that only a fool would knowingly choose the path I did. I made a conscious decision that whether it took 2, 5 or 10 years, that’s where I was going. Ironically, every time I have made the commitment the results typically materialize faster than hoped. Black: I’m not sure there is one person I could single out without alienating other valued mentors who offered sage advice with perfect timing along the way. There are many who have had massive impact on my trajectory who have no idea what they contributed. I believe it was Steve Jobs who said “You can’t connect the dots looking forward; you can only connect them looking backwards. So you have to trust that the dots will somehow connect in your future”. I remember my sister one time remarking about how I thrive in chaos. “Who thrives in chaos? How do you do it? Clearly you were meant to do this…”. I remain convinced that there was no accident in any of these people showing up and unwittingly offering wisdom exactly when I needed them. Black: We are focused on international expansion and impact for 2019 and beyond. We aim to be the leading force globally for team development within the Real Estate industry. I have a decade long track record of being able to transform not just businesses but lives and lifestyles in an industry that is known for being stressful. I think we have an open road ahead of us and a team of professionals poised, and excited to take on such a mandate. As well, there really aren’t any other female leaders in this space. As a single working mom, I’ve been both lucky AND focused enough to have the opportunity to get us to this point and I’m looking forward carving this path further. Black: Conscious living. I think people who are conscious about who they are, their values, and what they’re bringing to the world are typically better parents, better team members, better community supporters, better people. I find the ability to ‘do good’ is just more naturally present for people with a conscious mindset. If I can help people raise their consciousness and see their abilities and power, they will ultimately serve the world through their greater purpose with ease. If KBCC can have any influence on people leading themselves versus looking at others, that’s a win! Black: Look for patterns. Any challenging situation I’ve found myself in has had a pattern that repeated itself because I had not yet realized what I was meant to get out of the experience. The issue would come back stronger, louder and more painful. Hindsight suggests that I NEEDED to have those experiences in order to learn what I’m capable of. In those instances when I have managed to avoid blame, lean into the experience and seek clarity, I have always come out the other side feeling each time like it gets easier and having greater confidence to tackle the next challenge.